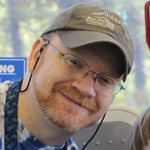 If you compare the above recipe to other sources for the "official" Disney World recipe, you'll notice that I'm a tad heavy on both sugar and vanilla. The reason for this is simple - Magic Kingdom is known to prepare their waffles just a bit stronger on these two ingredients, resulting in a slightly sweeter waffle. I prefer this, and so, my recipe reflects that. If you like, you can cut both the sugar and vanilla in half. 1. Combine eggs yolks and sugar in a large bowl, and beat until the yolks are thick and sunny colored. Add the milk, cooled melted butter, and vanilla extract, then stir until combined. 2. Add flour, baking powder, and salt. Mix well, but don't overmix - if your batter is frothy and full of bubbles, you've gone too far. Your batter should have a consistency of thick pudding; if it's too thick, add a little milk and mix until you reach this texture. 3. 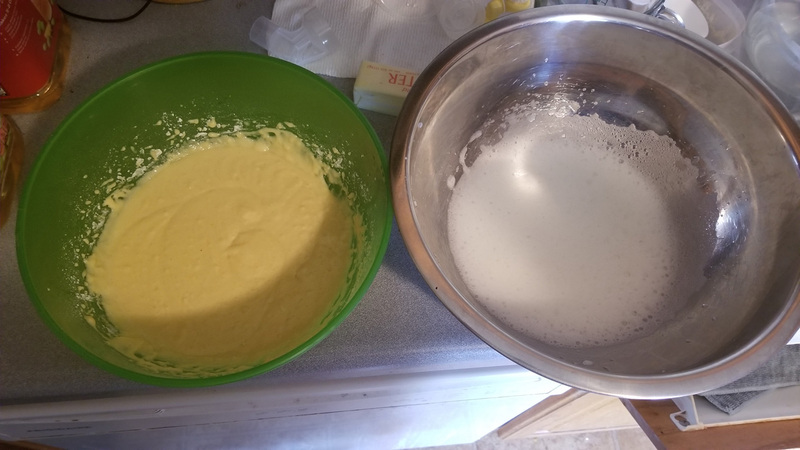 In a separate bowl, beat your egg whites with a mixer until they are stiff - the liquid slides off your mixer and makes a "peak" or pile on the surface of the eggs. First, the egg whites will be foamy, then thicken and fall in ribbons, then stiffen. You can beat them for too long and lose this stage, so be careful. Note that if you have even a speck of water or egg yolk in your eggs, you will never reach the true "stuff peaks" stage. Take heart, though; if your egg whites don't behave perfectly, it won't ruin the flavor in any way... the finished batter simply won't rise as well, and the consistency will be a little more dense. Waffle batter mixture on the left, egg whites on the right. 4. Using a rubber spatula, gently fold the egg whites into the batter. DO NOT MIX. 5. Bake following the instructions on your waffle maker, until golden brown. Note that these waffles rise considerably; in most waffle makers, you'll want to just barely cover the cooking surface uniformly. If you layer them deeply, you will get serious spillage as they cook. 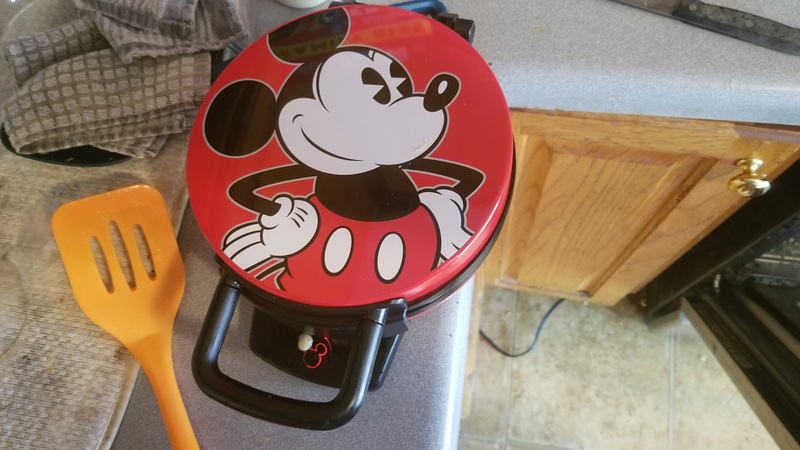 I personally feel that appearance is a hugely important factor in these, so I use my Mickey Mouse Waffle Maker for this recipe. This little thing adds a lot of fun to the process - and makes great waffles, too! 6. Enjoy! I personally eat my Mickey waffles with butter and syrup, but naturally, any waffle topping is fair game - fruit, whipped cream, powdered sugar, chocolate... you name it! 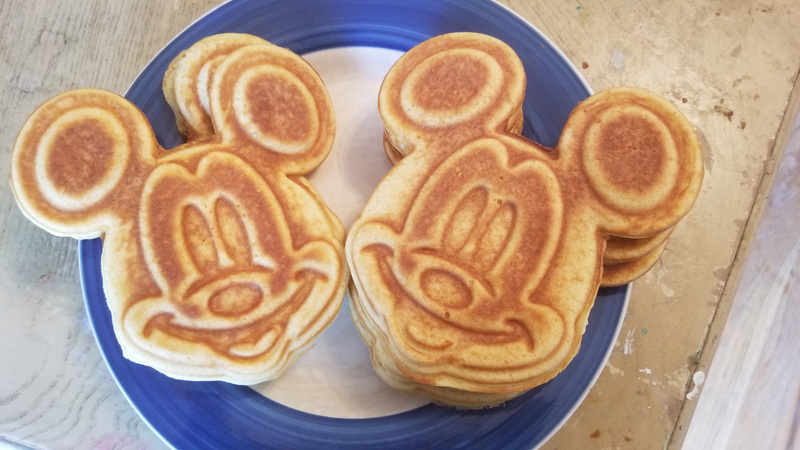 Mickey Mouse waffles - tasty and fun!